Works great. They don’t get used often, but when they do there are no issues. I have had these for about 3 years and they still look like new. No rusting, no pitting, etc. 15¼" x 12½" x 15" Hammered Copper Chafing Dish, 4 Qt. Cater for the crowd at your next big party or local gathering with this eight-quart chafing dish. 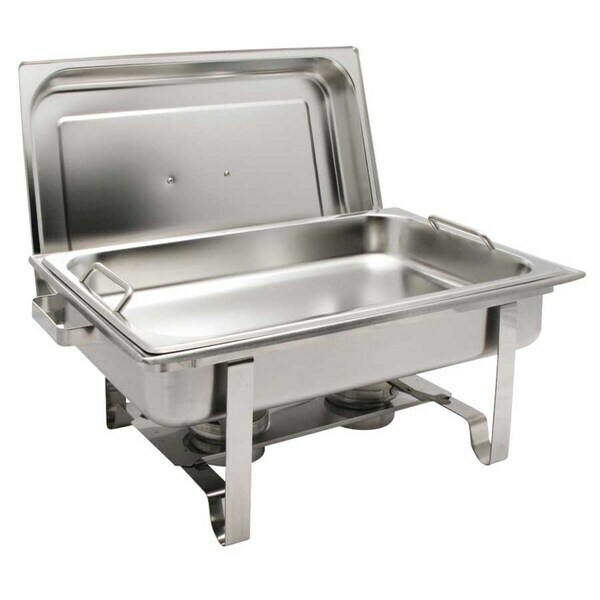 Made of durable stainless steel that never needs polishing, this chafing dish is durable and long lasting. The dish cover conveniently clips onto the chafer frame when food is ready to be served. Lift to swap out food without prying or scalding, preventing mess and safeguarding against accidents. As a Caterer I used this product during the Holiday season. It was the Best! the handles on the food pans was delightful! The chafing dish holds a lot and keeps the food hot. Easy to wash up. The price is right. I expect to use it for years. Needed a chafing dish for entertaining. This product is great. Thanks. chafing dish is sturdy and a great buy. Purchased this chaffing dish for a party and it was fantastic! Chafing dish is not as "heavy duty" as I expected. Served it purpose for the occasional user. Food burns because the bottom is so thin. Haven't used it yet but it is of good quality and I 'm sure will work out well for us. "Hello Customer Service, does Winco Get-A-Grip Chafing Dish come with fuel? If not where can I get the fuel and what kind does it need." Hello val24, you can refer to item number 12345872 for the fuel that this will use. Thanks for shopping with us! "Is this oven safe? Then transfer to buffet?" Hello, dawn. The stainless steel construction is in fact oven save. Thank you for your inquiry.